In this week’s installment I’m going to go over the process for changing scores in MyMathLab. Of course you can open each student’s assignment to change individual grades, but I will be going over how to apply a batch grade change for multiple students on one assignment. Access the Change Scores page for the assignment. In the MyMathLab Gradebook, click on Homework, and scroll until you reach the correct assignment. 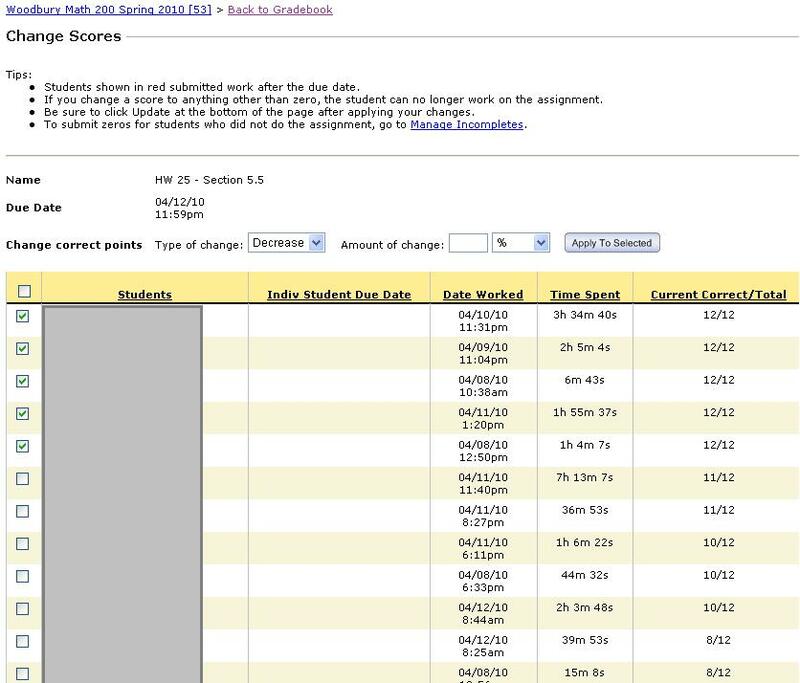 Under the name of the assignment, click on the “Change Scores” link. Once the Change Scores screen opens, click on “Current Correct/Total” to sort the scores in descending order. I can now select the students who have already received perfect scores by checking the box next to their name. In the example, I checked 5 students who have a perfect score. Now I change “Decrease” to “Increase” and enter 10% for the amount of increase. (Note that you can also adjust scores by points rather than percents.) To apply the increase, click on the “Apply to Selected” button. Scores that have been changed are denoted with an asterisk, as shown below. To finish changing those scores, you must click the “Update” button at the bottom of the page. If I leave a certain type of problem out of my lecture, I will offer extra credit to students who figure out how to work the problems on their own. I count the number of problems, and increase each student’s score by that number of points. Students who learn how to do the problems get a bonus, while those who do not try them are not penalized. Some instructors like to allow their students to keep working after the deadline, with a penalty. At the deadline you can select students who have not finished the assignment and decrease their score by the desired percentage or number of points. The MyMathLab folks have added this feature to make our gradebook management more efficient. There are times when I use this feature, and it is always a time saver. If you can think of any other features that would be helpful to you, try logging into the community boards at mymathlab.com. They are very responsive to our input. If you have any questions on this feature, or if you’d like to share how you use this feature, leave a comment or email me through the contact page on my website. Entry filed under: Math, MyMathLab. Tags: algebra, amatyc, change scores, change scores mymathlab, college, developmental math, education, george woodbury, Homework, ictcm, Math, MML, mml gradebook, my math lab, MyMathLab, mymathlab gradebook, NADE, Pearson Education, prealgebra, statistics, stats, woodbury.